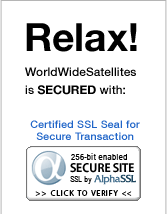 WorldWideSatellites Makes it easier for you to order. Below are the 7methods of payment we accept. *We only accept International Money Order for Customers located outside of North America. protected with up to 256-bit Secure Sockets Layer encryption. 2. Credit Card By Phone. business day. *You can call us to make a payment over the phone 1-866-60-ASK-WWS. is exposed making it 100% safe. 1) Add the items in your WorldWideSatellites shopping cart. 2) Select "Paypal" as your method of payment. 3) Once you get to the Paypal screen, click "If you do not currently have a PayPal account, CLICK HERE". 4) You make your purchase directly with credit card. Your credit card statement will show a charge from "PAYPAL*WWSATELLITE" PayPal (with account). This payment option only accepts USD funds, if your canadian your total will convert to USD dollar. we will confirm the order by resending your confirmation email, and ship within a few business days. 6. Email Money Transfer Interac. *This option is for Canadians Only. 7. COD (Cash On Delivery). *Please note we may require pre-payment of shipping cost prior to shipping the product COD.